Anyone who is tired of the hassle of removable dentures, there is hope! You can finally get a healthy-looking set of teeth without the care and tedious work of dentures. The all-on-four dental implants are changing the way people look at and think about dental implants and prosthetics. This differs from traditional implants because there is no need for an implant to be inserted for every tooth- instead, four or more implants can secure the entire top or bottom denture into place. Not only does this significantly reduce the complexity of the treatment, it also reduces the healing time and maximizes the stability of the implants. You have a shorter recovery and a set of healthy looking teeth the same day all without the typical problems that come with dentures. It truly is another example of the advanced dental care and treatments that are available right now at Loop Perio. These implants are designed for individuals who are missing multiple teeth or need to have teeth removed due to injury, gum disease, or some other problem. Some patients may need implants because their current dentures have worn down. In most cases, all-on-four dental implants are made to replace the entire top or bottom set of teeth, but smaller partial sets can be done if fewer teeth are missing. The best candidates will be in relatively good health otherwise and have few if any other oral or dental problems. At Loop Perio, we offer a range of advanced dental care and treatments, and we have helped many of our patients determine if all-on-four dental implants are the right choice for them. We can do the same for you! The beauty of the all-on-four dental implants lies in their simplicity in terms of placement and surgical requirements. Instead of making a post and implant for every tooth, there only need to be four posts inserted into the jaw. Then on top of those four posts we will fix the custom made dental prosthetics that look and feel like healthy natural teeth. With these securely anchored onto the four posts, you now have a permanent prosthetic that gives you greater freedom for chewing, talking, drinking, etc. It is thanks to advanced dental care and treatments like all-on-four dental implants that individuals who would not be able to have implants can manage to get a healthier looking smile. Some dental implant procedures are very involved, costly, and time consuming. They require multiple surgeries for placing the posts, bone grafts to provide enough support for all the posts and several months of recovery time to achieve full healing. This, of course, requires a lot of materials and time, all of which costs a pretty penny. This is why many people who need implants and who would benefit from them are unable to get the treatments. However, thanks to all-on-four dental implants, the process is much faster. Each jaw- upper or lower- usually only takes a few hours for the surgical implanting of the posts. The temporary denture can then be fitted and secured over the implants the same day. You will need to be on a soft diet for two weeks or so, then all that is left to do is to get used to living your life free from the hassle and headache of removable dentures! After 6 months of healing, your dentist or prosthodontist will make you a new prosthesis and replace the temporary denture with your new custom made teeth and attach it to the implants. While it is true that all-on-four dental implants are changing the way that we look at dental care and cosmetic dental procedures, there are still some things that are not going to change. No matter what treatment or procedure you have done, you still must take care of your mouth. Even prosthetics and implants need to brushed and flossed like regular teeth. They also must not be overly abused. They can handle the normal biting and grinding that normal teeth can, and most are even stronger than natural teeth. However, this does not mean you can or should be chewing on ice all day long, biting pen caps, or doing other things that could damage your new implants. Once every 6 months your dentist or periodontist should unscrew the prosthesis and thoroughly clean and check everything. They will then put it all back together. This cleans the areas you cannot reach and checks to be sure the implants and screws are secure. While we have access to advanced dental care and treatments, we still have to be smart and take care of our teeth! It is easy to see why this type of implant is gaining popularity and why it is one of the most asked about procedures. 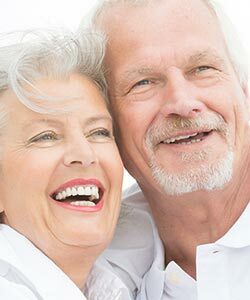 Whether you are young or old, if you have severe dental issues that have affected most or all your teeth, then all-on-four dental implants may be the answer you have been looking for. Thanks to the progress that has been made when it comes to advanced dental care and treatments, you can get a healthy smile that you can be proud of! This highly successful procedure can help you take back your life. Don’t wait any longer to find out more about this breakthrough procedure.